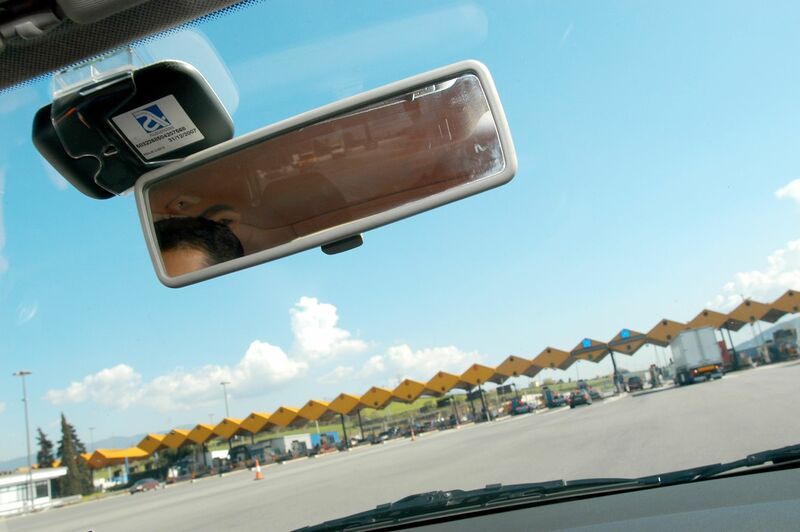 There are broadly three kinds of ‘road user charging’ in Europe – traditional road tolls paid at a booth after the journey; a vignette allowing cars to use some or all of the road network; and electronic tags that pay tolls automatically when passing through a barrier or control point. To make it a bit confusing, some countries use a combination of all these methods. We look at each in turn, but first list the countries that do not charge for using the roads. Click the blue links below for the official road charging website for each country, in English. 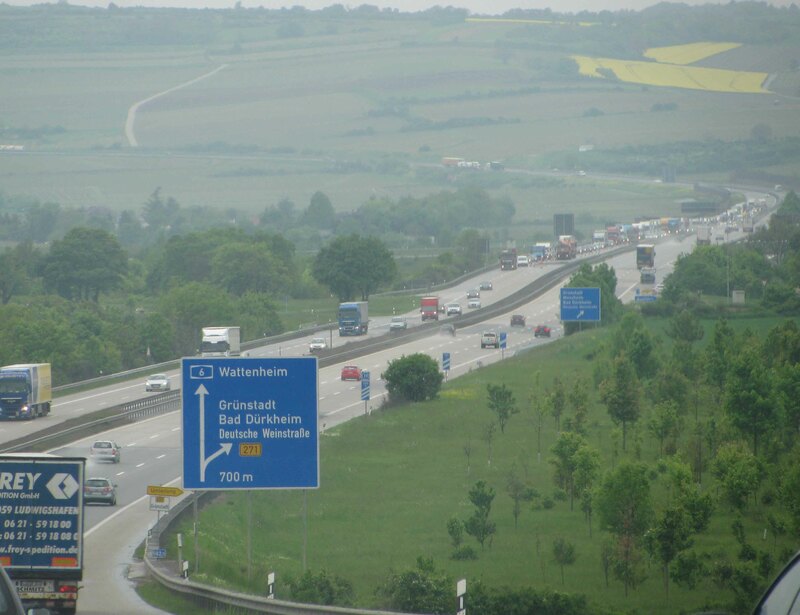 Germany: lovely long motorways, and free too. These countries do not charge to use the roads in general but there might be charges to use certain bridges or tunnels. In alphabetical order: Belgium, Denmark, UK, Estonia, Finland, Germany, Latvia, Lithuania*,Luxembourg, The Netherlands, Sweden. *Lithuania – large campervans may need to buy the commercial vehicle vignette. Click for more. 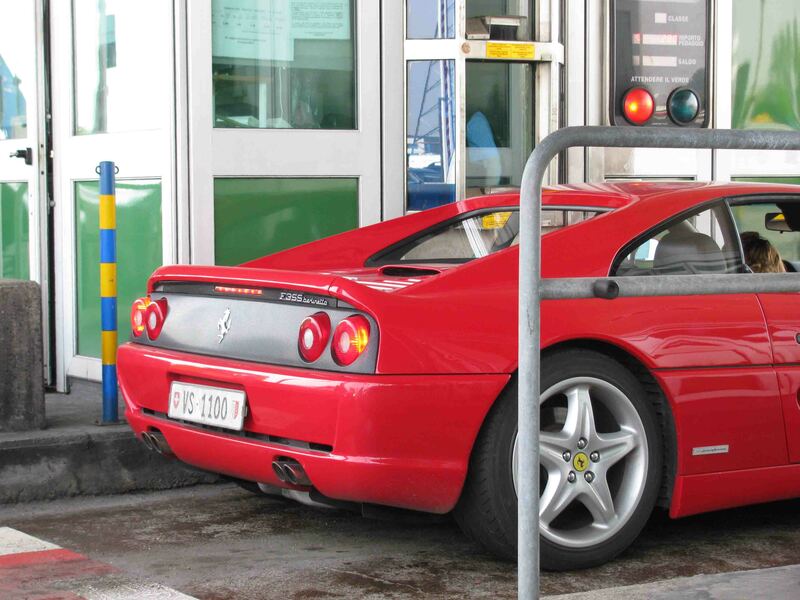 Italy: Even Ferrari owners have to scrabble around for change. Road tolls: Bosnia and Herzegovina, Croatia, France, Greece*, Italy, Norway, Poland, Serbia, Spain. These countries charge by the kilometre to use the motorway network but, because the roads are operated by different companies (in western Europe anyway), there is no set national charge. See below for averages. There’s no advance preparation for road tolls, just turn up at the booth and pay. Make sure you are in the right lane – there are autopay, cash, card, and commercial vehicles lanes at most Peage these days. Also, keep lots of coins, or your credit/debitcard, handy. Note: in France, UK drivers have the option to buy an electronic tag to use the fast automatic payment lanes, see below. In Greece, there’s no motorway authority website in English. See here. Costs: France is the most expensive, on average about 7c per km. In Italy expect to pay around 6.5c per km, in Spain about 5c per km. Norway comes in at about 4c per km. www.ViaMichelin.co.uk includes toll charges in its route planner, as does www.mappy.com. Meanwhile, the almost universal lack of receipts means keeping track of tolls on a long trip is difficult. That’s why we generally pay by card. Autopay tags usually attach behind the rearview mirror. Automatic payment tags are compulsory in Portugal and optional in Norway and France. Those driving in Portugal should click this official information page or, better still, this page from English language newspaper The Portugal News about driving with a foreign registered vehicle. Briefly, drivers need to rent a tag by registering credit/debit card details at a vending machine (seriously). Money is automatically deducted and the tag returned at the end of the trip. Over 20,000 British drivers have registered for the French Liber-T tag since the scheme was launched last year. Read our roundup of the pros and cons here. Foreign drivers have a range of methods to pay road tolls in Norway – prepay, postpay, autotag, cash or card. Read the official run down for the one that suits you best. There are two types of vignette, paper or sticker. They apply to the whole road network or just the ‘national network’ of motorways and some dual carriageways. Vignettes are widely available – from most petrol stations, even in neighbouring countries near the border, or from booths on border crossings themselves. Needless to say, fines for not buying vignettes can be hefty. Vignette stickers crowding the windscreen are the bane of every transcontinental driver’s life. It’s quite cool though that all the neighbours can see where you’ve been on holiday and unavoidable because they are deliberately hard to get off (and impossible to re-stick). Most countries that use vignettes sell a range, depending on how long you will be using the roads. One day transit vignettes used to be widely available but not any more. One week/ten days is the modern minimum, then a month or year. The exception is Switzerland which only sells an annual vignette for 40CHF (€33.33). 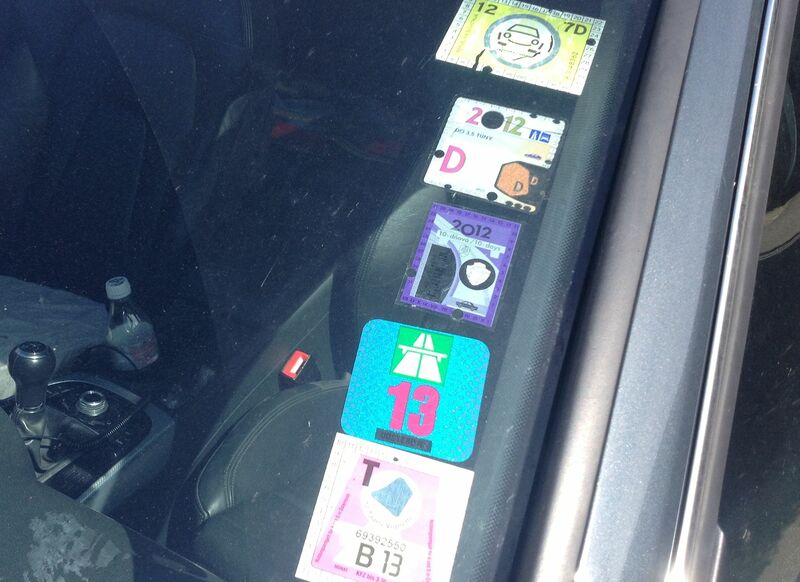 Apart from Bulgaria, do not buy a sticker vignette if you are not going to use the motorways. In addition to a vignette, Austria also uses traditional road tolls on some motorways and tunnels. Sticker vignettes are not transferable, either physically or legally. Instructions for where to stick them are on the reverse, in English (normally down the opposite side of the windscreen to the driver). You might need to write in your registration (else they are invalid). Keep the counterfoil. Vignette – vinyet – is a widely recognised word, as is toll. In alphabetical order: Austria (scroll down), Bulgaria, Czech Republic, Slovakia, Slovenia, Switzerland (for ordering only, no English info. includes Liechtenstein. See for more). Costs: one week normally comes out at around £10 for a car. Slovenia is €15 (but worth it). 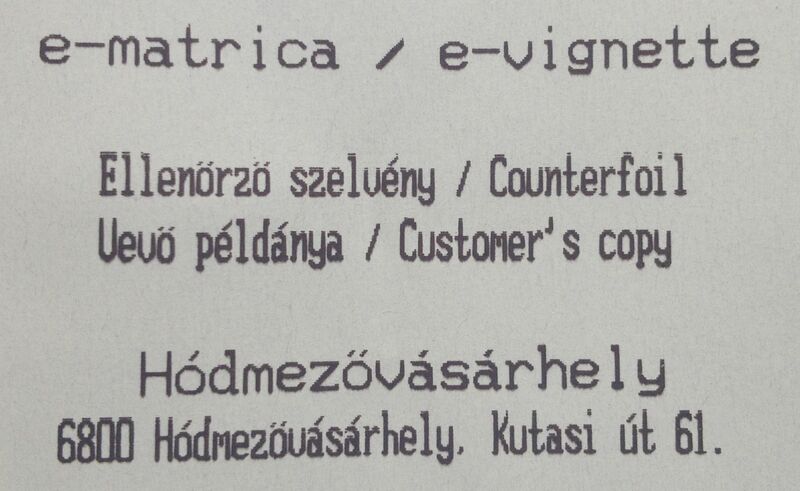 Hungary paper vignette: a week’s driving on Hungarian motorways costs 2,750HUF, or about £8.50. It takes a few minutes to get and you must keep it for one year after expiry – Hungarian authorities can track you down in the UK. Paper Vignettes – Hungary and Romania. Paper vignettes have to be ‘applied for’ which makes them a hassle even though it’s done as-you-wait. You need your car registration, and maybe some ID too. They also need to kept in a safe place and presented on demand by law enforcement. The Hungarian vignette should be kept for one year after it expires. It’s in your interest to do so because the authorities can track you down back in the UK. The Romanian vignette is needed to drive on all national main roads. Costs: Hungary’s minimum vignette is one week. It costs 2,725HUF (£8.50) for a car. For a campervan it’s 13,385HUF (£40) per week. The Romanian ‘Rovingette’ is €3 per week. Greece: €2.40 can take you 100 miles. The European Commission hates vignettes, considering them to be a blunt instrument. It much prefers tolls which can be used to modify driver behaviour (by pricing people out of the market at peak times) to tackle congestion (and pollution). This is all rather awkward as Belgium’s on-again-off-again road user charging plan will be vignette based and if Germany decides to introduce road user charging its preferred method will be vignettes too. We all wait with baited breath to hear what the Commission decides after its consultation last year. A pan-EU plan was due to be launched in June but there’s still no word. It’s not difficult to predict however: a variable charge, single account, electronic unit based system of tolls across Europe with a portion of revenues for the Commission, and another portion ring-fenced for investment in the road network. Let’s see. Driving is a kind of freedom. This feels like loosing a bit of freedom of movement. And it is even worse as it will be done in the name of fake global warming fight. Have tried and failed on the Italian website to discover details of prices for different sections of motorway. The English part of the site isn’t operational, but couldn’t find the information in the Italian section. Hahahaha… Technology pfffft. Yeah right, the correct amount is deducted from your credit card, “until” there is a problem or glitch with the electronic system. Always better to hand over cash. What you hand over is what you pay, no mistakes, no fighting to get your money back when there is a mistake, and no paying expensive bank foreign country exchange fees for international tourists travelling on foreign roads. The EU is project for freedom and no borders. How is possible EU commission to hate vignettes? The freedom of driving and traveling is dead when you implement pay-tools, especially in small countries where you can have 4 pay-tools on a 60 km distance, it is like stopping every 8 minutes it does not make any sense. It is time for governments to stop being hungry for PROFIT and free the roads and highways. However if it is required it is better to have vignettes, because they do not make traffic jam and increase pollution. Vignette, road tolls and modifying driver behaviour are all good reasons for me not to spend my hard earned cash on European vacations. To those countries, if you value international tourists, “get rid off them” they are a rip off! I can travel in my own country for free, why should I come to yours??? Just to copy a post elsewhere on this site, I use https://www.tolltickets.com to buy any of these I need for Europe. Does anyone know why after paying by Credit Card for Tolls in Spain sometimes a part refund of the charge is credited to my credit card. Hullo everyone. I am from New Zealand and will be driving around Europe in May, June and July this year. 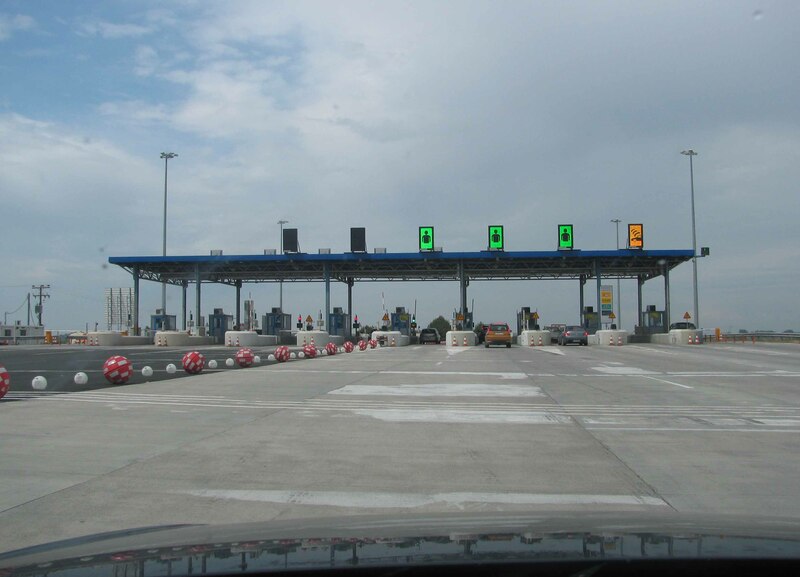 I have been looking at information on tolls for different countries and it is confusing that some have booth tolls, some have AutoPay and some rely on vignettes, or a combination of these. it is all a bit confusing. We will travel from France, through Germany, Poland, Slovakia, Hungary, Romania, Croatia, Slovenia, Italy, France, Spain and Portugal. If I put charges onto e.g.Visa card, I will be stung by exorbitant currency transaction fees and poor conversion rates. I can’t see that Europe has one card that is transferable between countries, so can anyone suggest my best options with least bureaucracy and most efficiency for negotiating borders. I have been ripped off previously by corrupt police in certain countries even when using non- toll roads, so I want to remain legal. Our currency is not strong and I can’t afford fines. Very interested to hear your advice. Thanks, Neil. HI, I am travelling through Europe this august and like others am astounded by the information on different tolls and vignettes needed for different countries. We are travelling through France, Belgium, Luxembourg, Switzerland, Italy, Austria, Germany, Netherlands. Does anyone know about a sticker we need to obtain before we get to Heidelberg in Germany to drive in the City? also do you recommend we get a auto pay tag for France and Italy as they seem to be the most expensive for tolls? I will get a Vignette for Switzerland and Austria. Thank you for the links, I will check those out. We are going from the UK so taking our own car for this road trip which is why we are enquiring for such information. I usually do road trips through France and Spain but have never done a trip through this many countries. I checked out tolltickets.com and they seem to have most of the relevant Toll boxes and Viganettes and I can purchase them all in advance which is great, but don’t have any information on the environmental sticker for Germany. I will update to let you know how I get on! Thanks again. Hi Nora We have just completed a 6 week 9200km road trip thru 10 countries ending in Portugal. I was as confused and lacking information as you sound. As it turned out at every border there was somewhere to buy a vignette and they all accepted our NZ credit cards. Many are recently built or new that didn’t exist some years ago. So it was easier than expected. I was a bit paranoid because of a nasty experience with Slovak border cops in the past. But Slovak, Hungary, Romania and Slovenia were ok. The one that beat me was Portugals system that,in the end, I used sat nav to stay on non toll roads to avoid any unintentional camera infringement and subsequent fine. Wasn’t aware of any city specific vignettes though. I think Switzerland is the worst -their system is extortion if you only want to transit -they have lost out on my tourist dollar as I now have a policy of avoiding it. Best of luck with your trip. Neil. Hi Andy- UPdate for you – Unfortunately looking at the map our hotel falls well within the zone on the east of the city as we are by the river. I have placed an order for the green zone badge for Germany on http://www.umwelt-plakette.de It was a straight forward form to complete and you have to upload your V5 document. Costing 31.90euros and has no expiration date. wow €6 v €30+, what’s the catch?? I have just driven from the UK to Bulgaria via both Hungary and Romania and didn’t have to pay any fees due to putting avoid tolls and motorways into my sat nav. Ok it took me into place I would have missed seeing. But we enjoyed the site’s as we ttravelled along instead of speeding along a long boring motorway.